Ring flashes are different to regular flashes in that they offer nearly shadowless on camera images . The light surrounds the lens meaning there is no single shadow but instead a slightly dark but diffused shadow that goes around the subject. You’ll often see these lights used in music videos on MTV or in high glamour fashion shoots in glossy magazines as they create quite a dramatic and glamorous style of lighting, partially because they create very attractive catch lights in the eyes of the model. But these lights are very expensive. The only affordable versions are small and weak ring lights that are supposed to be used for macro work. As they’re used for extremely close proximity subjects (bugs and flowers) they just don’t have the power to be used for things like portraits which will be shot at further distances. Which is where ring flash adapters come in. They are cheap adapters which mount on to a speedlight flash and channel the light from the flash down light reflecting channels, if you will, and into a the light emitting part of the adapter which is ring shaped. There are no electronics. It is in essence a light funnel so it is a fraction the cost of a real ring flash. The Orbis is one such adapter. The build quality is quite decent and is as good as it needs to be for its application and is simple in its design. The internal chamber is coated in a chrome finish to allow as much light to transmit to the ring part of the product. The mount is very well designed. As it’s designed to be universal to be able to fit all speedlights, it has a “v” shaped internal mount that is quite rigid but flexible. But imagine a “v” with the bottom point open. You insert your speedlight into the mount (in this case I used a Sigma 530 DG flash) and the v-shaped blades inside separate at the open end of the “v” as the flash is inserted. Because the blades are quite rigid, they remain tight on the flash making sure it is a snug and firm fit. 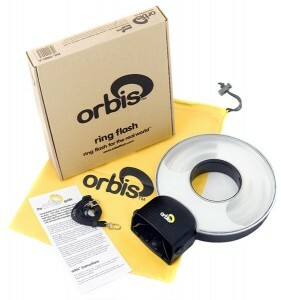 The difference between the Orbis and the competing brands is that the other brand’s versions are designed to be used with the flash on camera. It’s not heavy but it’s not exactly light either, so when combined with the weight of the flash and the unit itself, that is a lot of weight and pressure to place on the hotshoe mount of the camera and with prolonged use, I wouldn’t be surprised if something were to give. This Orbis is designed to be used with the flash off camera, partially as to not put so much pressure on the hotshoe mount, but also because it now frees up the flash to be positioned where you like, and not just around the lens of the camera. This means the flash needs to be used on a light stand to hold the combination up. The flash needs to be positioned in an upright position as the Orbis has no kink in the neck, unlike the on camera version, as it doesn’t have to bend over the front of the camera to surround the lens when mounted to the flash, so it just sits above the flash it is mounted to in an upright position. This also mean the flash needs to be triggered either with its built in TTL triggering (if the flash supports this) or with wireless radio triggers. Unfortunately, that is were I stopped being impressed with the Orbis. Firstly, the diameter of the ring is just too small to create the catch lights that are so sought after with these type of lights. If the model is standing at a normal shooting distance, the catch light is visible, but it is a small white spec, and even then, that is only visible while zooming in on the picture a lot. To get the typical doughnut shaped halo light in the eyes, the model has to be standing within half a meter from the light. At those distances, lens perspective distortion is a major a problem and far too pronounced for the images to be even remotely flattering. The nose becomes huge and ears become small. It just doesn’t look natural. Not to mention controlling exposure to have an evenly lit face is not going to happen. The nose is hard not to completely blow out while getting the rest of the scene correctly exposed. Because the diameter of the flash is relatively small, the amount of diffusion is very minimal so lighting is still quite harsh. Also, a lot of power is lost so at regular distances the lighting is quite weak. The best use I got out of it was using it as a fill in light in conjunction with other speedlights. Having the flash and Orbis off camera allows you to move freely and quickly with your camera without having to worry about whether or not you’re putting strain on the hotshoe mount, but it means having to align your light stand every time you want to change shooting angle when you want to shoot with your lens in the middle of the Orbis. You could hold it by hand in front of your camera, which I did try, and did work reasonably well, but that left me having to hold my heavy camera and lens with only one hand and my arm quickly got tired as a result. There is a bracket available for mounting the flash below your lens so the Orbis can go around it though that does make your whole camera rig a little large. In my opinion the Orbis would be far better suited as a macro ring light as appropriate subject matter would be far closer to get a much softer light. At the same time my colleague Tristan seems to enjoy it. You can see his thoughts about it over at This Week In Photo. Nice write-up, where can I get the Orbis ringflash locally?